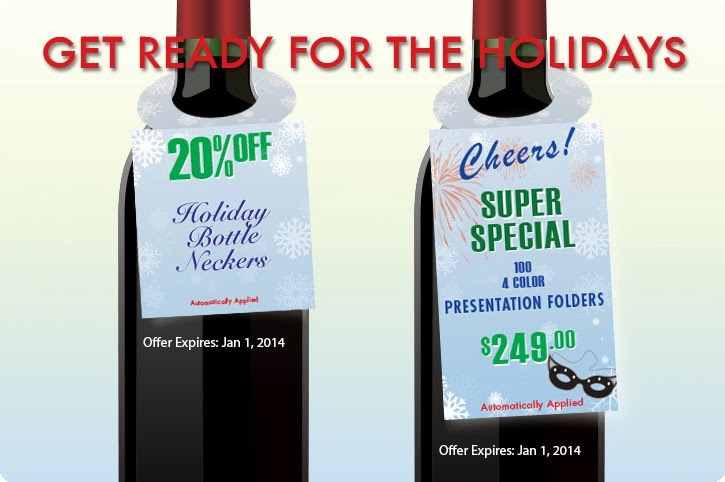 TAKE 20% OFF CUSTOM PRINTED BOTTLE NECKERS! It's that time of year again. Time to think about gift giving and holiday parties and Folder Printers is here to help! We have come up with a great deal on a great gift idea! BOTTLE NECKERS. We have all been there, scouring the internet and malls for great gift ideas for our clients and/or employee's. Let us take away the stress. Why not hang a BOTTLE NECKER around a nice bottle of their favorite wine or spirit? Voila, you just made their holiday. To get your free estimate on custom printed BOTTLE NECKERS CLICK HERE. This is really a great idea. You can now make an event of the lovables a memorable one with custom bottle neckers. Bottle neckers are a great source of advertising your business and brand. Attractive customized bottle neckers will surely make them smile.